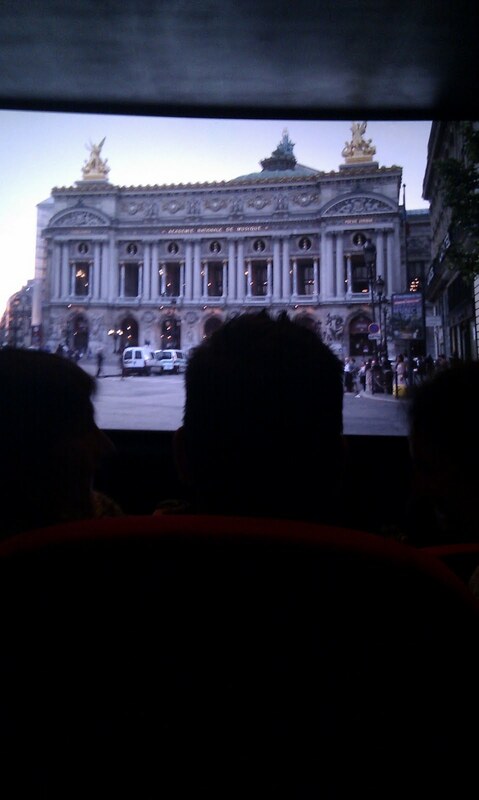 The first big advantage of the cinema experience is that it’s not as pricy as the opera, my ticket was 23 euros and I could book it online the day before, I could have bought it even just before the performance. When I look at opera ballets on the other hand, the prices range from 45 euros to 100 euros, and to have good seats you need to book your tickets really early, yet you can still book them online. Last time I went, I paid 60 euros one week before, and the seat was just “ok”, it was a good category but I was still really far from the scene. Opera ballet is something you plan, not something you can decide on an impulse like going to the movies. The second advantage of the cinema is that your seat is not written on your ticket so you can easily get a good seat if you arrive a bit early. That is what I did. Of course, we could also say that the advantage with the opera is that your seat is fixed so you don’t have to worry and you can arrive when you want. But at least, with the cinema nothing is decided in advance for you. You have the choice of your seat. Apart from those practical advantages, there are also experience advantages that I wanted to evaluate in a user experience study. Objectively speaking, what I want to get from the experience is seeing the ballet, this is the information that will be remembered by my brain, so how would getting this information from a screen be different from getting it from a live scene? Can technology ever replace the real experience? If you remember my post where I boast about my phone(…:)), I was describing how awesome my phone was for letting me quickly get information about the ballet I was seeing and read its story during the ballet. In a real opera, there is no information about the ballet you’re about to see, rather you need to buy a booklet or inform yourself before actually seeing the ballet. Personnally I really go to a ballet for the visual impressions it leaves on my mind, the story is an extra bonus. The real advantage here of having the ballet retransmitted was that there was much information added on the screen about the ballet, like you would have in a documentary or a movie. All the production crew was in the credits and there was a small introduction of the story in the beginning, as well as an introduction of all the characters. You were well informed about the ballet, so you could fully enjoy it. I remember my last experience, with my friend we were totally lost in trying to understand what was going on because the ballet is speachless, it is really only visual. So big advantage of technology : all the meta information that can enrich the experience. I think that is about all the advantages I could find to the cinema experience. I’m doing this review to really evaluate what technology is capable of and avoid snobby judgement about the real and the virtual. But from the experience I had, I still have a small preference for the live show. Here is why. Second, there was a technical problem during the retransmission: at the end of a scene, the screen just went all black and we were left in the dark for about 5 min. Panic room. Maybe a cable just broke somewhere. Obviously this would not happen in a live show. Viewing a virtual scene really depends on the reliability of the technology used. Eventually, after 20min, the projection continued. Finally, even if the characters on screen were practically the same size as on the real stage, something was bothering me while viewing the ballet. I didn’t feel as moved as when I saw the last ballet. I couldn’t see what was bothering me until I realized there was a difference in the sound we were hearing. The cinema room is not designed the same way as the opera house which is specially designed to enhance the sound of the playing orchestra. Indeed, the music of the ballet is played by an orchestra down the stage. The resulting sound in the cinema is not quite the same as in real. But what bothered me the most was that the ballet was edited as a movie, with camera movements and zooming. Sure, this was very good to focus on the important characters and moments of a scene, but it really bothered me because I couldn’t see what else was going on on stage when the camera was zooming. This effect gave me the neat impression of not being there, I could clearly perceive the limits between me and the live show, I was not there. If I was there I could have the choice of focusing on what I want whereas in the cinema the focus of action was decided for me in the way the movie was edited. I didn’t have the choice to focus on what I wanted, my eyes couldn’t wander on every detail on the scene, I could just see the main character. This was disturbing. In the live show, I would have been able to focus on what drew my attention. I missed that. I like to be overwhelmed by the scene, the moment, the music. Technology filtered everything. What would be great though, would be to be able to focus on what I like during the retransmitted show or even during the live show using an intermediate technology. So I preferred the live show, I’m still eager to see another ballet soon. But through this experience it was interesting to study the difference between the virtual and the real. I think technology does deliver the same information as the real show, but user experience makes all the difference between the real and the virtual. So, again this where UI is really important. Delivering information, is one thing, creating an experience is another. UI creates the experience. The same applies for the web with the difference that the web doesn’t really stand for something existing in reality. The web is already itself the “real”. So acting on the UI is acting on the experience. UI makes all the difference between websites. By the way, when my brother asked me how it was, I just said it was more awesome than Matrix and Inception combined. I told him it was a science-fiction ballet, how awesome would that be!